Written by Janet Choi on November 3, 2016 . 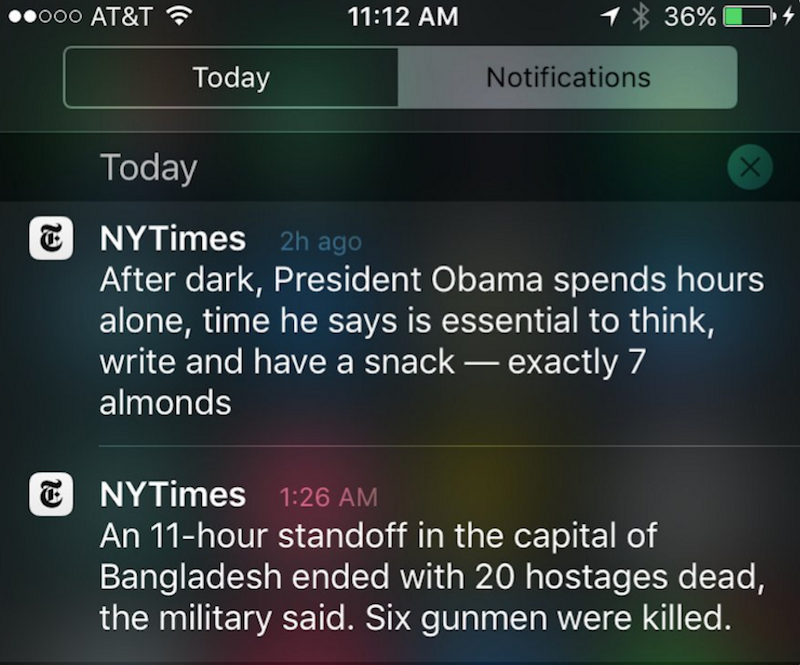 Imagine getting woken up by a push notification telling you that President Obama eats seven almonds as his nighttime snack. Not exactly the breaking-news alert you signed up for. The New York Times was recently called out for their push notification experiment that sent mobile users who’d opted in to receive urgent alerts from the publication quite the opposite. 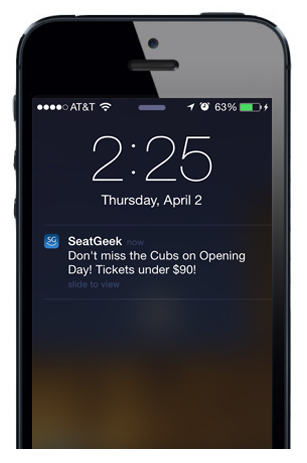 Push notifications are a tempting channel for mobile marketers, what with app users just a swipe away. But as more and more apps turn to push notifications, the channel has become saturated. Let’s have a little almond snack and then dive into how to use push notifications carefully. You wouldn’t ask someone you’re meeting for the first time for a big favor. That’s the time to get to know each other. Timing is key to navigating relationships and requests. Let users in on the value they’ll get out of your app before asking them to opt in to push notifications. This is especially relevant to your iOS users, who need to explicitly allow push notifications before receiving them. Social photo-sharing app Cluster does this particularly well. They fold the push notification opt-in process into their broader onboarding flow. 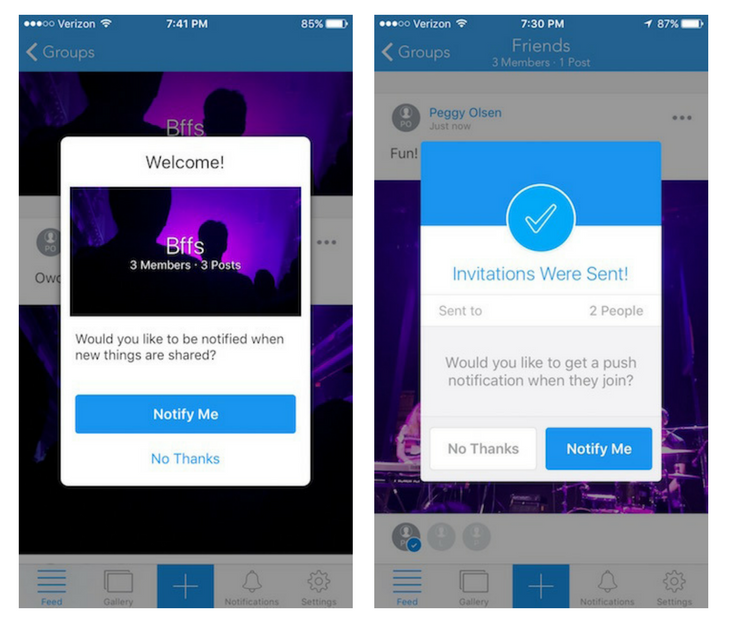 The completion of a key onboarding action like sharing a photo or sending out an invitation for someone to join the group triggers the request for push notification permission. This way, Cluster makes sure people get to an aha! 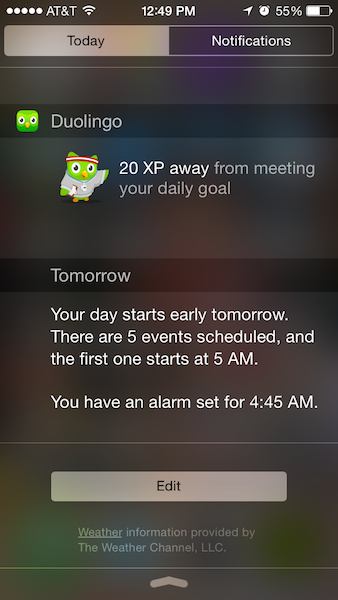 moment in their first-time user experience, which makes saying yes to push notifications easier and far-reaching. When users have indicated some meaningful engagement, having seen enough value (or potential value) in the app to upload photos and invite friends, they’re more likely to want to engage with Cluster. They can clearly see how they’ll get more value out of the product notifications too. If we’re smart about how we send pushes, each notification serves as an opportunity to inform users and find out what they care about (and hopefully drive some revenue). … If we notice patterns in users’ behavior, then we can send them information about events they’re likely to find of interest. Netflix uses a similar approach based on their data on what users have watched. 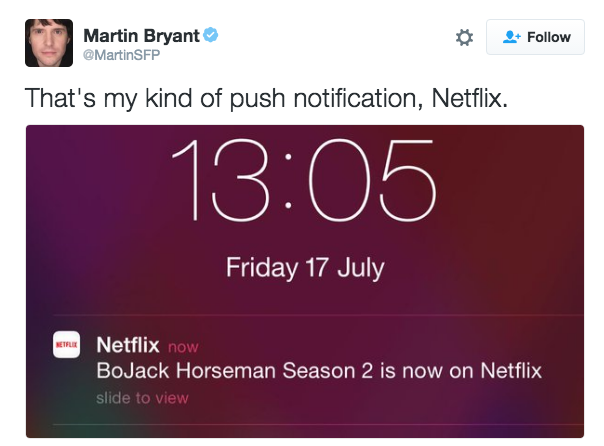 They deliver notifications when a show they know you’d liked and seen releases new material. Duolingo‘s push notifications are a great example of getting specific. 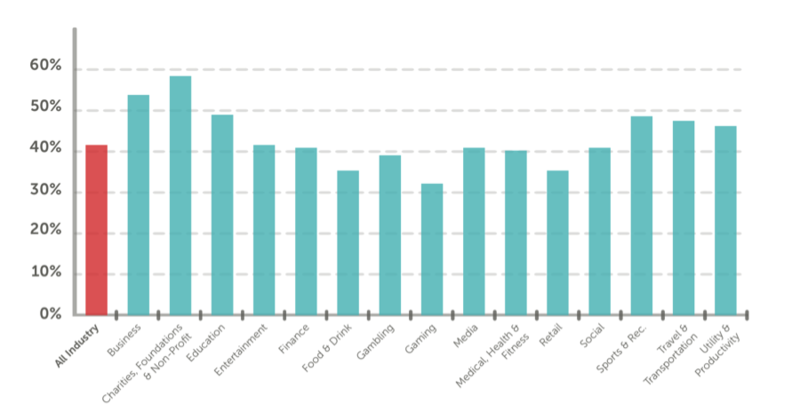 Every user sets goals during onboarding for how many experience points (XP) they want to gain per day. When they don’t achieve that goal, they get a friendly push notification (featuring Duolingo’s owl mascot) reminding them to come back into the app to complete their goal. Onboarding experts Appcues explain that this is particularly effective because it applies the psychological principle of commitment/consistency. Committing and setting goals themselves, as Appcues writes, “has a massive impact on a new user’s eventual success with the platform.” Persistent inactivity, even in the face of nudges, is a reliable sign of disengagement. 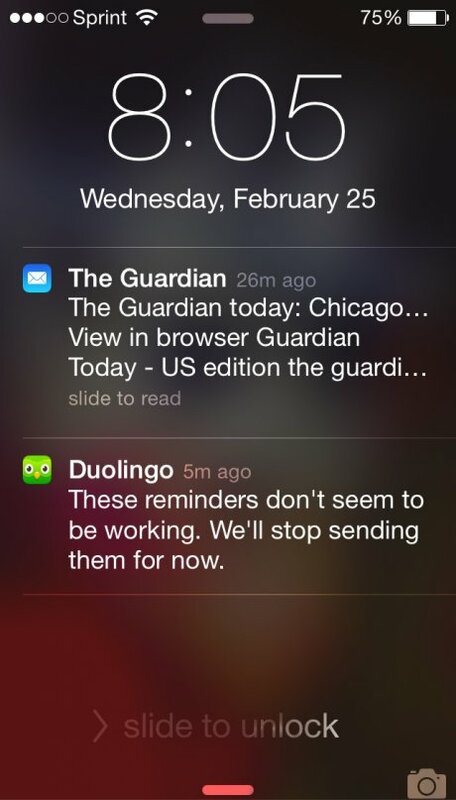 Duolingo’s approach of making sure their push notifications remain useful and motivating stands out. When they realize their messages are failing to move you, they stop pushing reminders. What’s really remarkable about Cluster’s strategy behind asking for push notification opt-ins is that in basing the timing on app behavior, they also priorize the customer experience. Cluster co-founder and designer Brenden Mulligan describes how their approach was built on increasing “users’ comfort and trust”, and explains, “We asked ourselves, what value would our users get out of push notifications?” The discipline and intelligence to not immediately ask for an open channel to contact people, to stop sending push reminders that don’t work like Duolingo, or to even simply not blast people with the same generic message is all too rare. Each push notification is an opportunity to deliver information that people care about—and behavior is a reliable indication of what they care about and when. We’re tickled pink about our new Urban Airship Action for adding push notifications to Customer.io triggered campaigns! Learn more about the new Urban Airship Push Action!